Your Cosmic Bowling Experience in Belton! 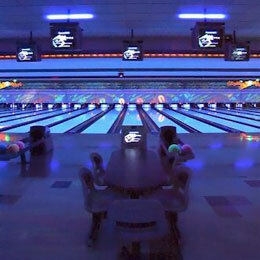 Aaron's Family Fun Center’s Cosmic Bowling is your Cosmic Bowling experience in Belton. Laser Lights, Disco Lights, Black Lights, and Runway Lights. LOUD heart pounding music. Our Cosmic Bowling lanes even glow in the dark during our Cosmic Bowling Events! Cosmic Bowling is the hottest bowling experience in Belton. Black lights, spot lights, strobe lights and fog teamed up with loud heart pumping music videos makes this the most bowling fun around. Our lanes even glow in the dark during Cosmic Bowling. Join us for a night of Cosmic Bowling and bowl under the disco lights and loud music. Contact us for details or to check times. Note: Aaron’s reserves the right to place up to 6 people on a lane during Cosmic hours. If you purchase a lane, we will not add additional persons to your lane.